Stuffed Paneer Potatoes recipe by Nazia Nazar at PakiRecipes.com. Potatoes stuffed with delicious cottage cheese and flavorful spices. Wash and peel the potatoes raw. Pressure cook for one whistle only. Cut a coin on the potato vertically and scoop out the inside leaving a thick wall. Mix the scooped potato , paneer, green chillies, salt well. Carefully stuff the mixture in the potatoes close mouth with the coin shaped lid. Heat ghee or butter, add the crushed chilli, garlic and ginger . Fry for a minute. Add the spring onion and sauce, sugar and salt . Carefully slide potatoes in and see that they are coated with the seasoning. 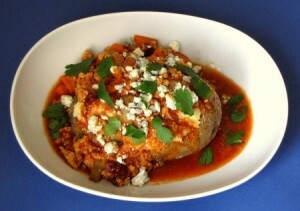 Before serving transfer carefully to casserole and bake in a hot oven for 7 to 8 minutes.